If you’re a movie lover, a trip to Los Angeles wouldn’t be complete without stopping off to see some of the locations featured in Hollywood’s most memorable films. There’s a range of places to visit, including natural wonders, public buildings, unforgettable architecture and luxury stores. Before you plan your itinerary, let us take you on a whistle-stop tour of Tinsel Town’s best filming locations. If you’re hungry for even more information on Los Angeles filming locations, you can also take a look at our special Airport Movie poster, which features some classic movies and TV shows filmed at Los Angeles International Airport (LAX). Beverly Hills is one of the swankiest parts of Los Angeles and a visit there may leave you thinking you’re on a film set. The hustle and bustle of A-list celebrities spending their hard-earned millions of dollars in the luxury boutiques and high-end brand stores gives you that silver screen sensation. Two classic 90s movies used Beverly Hills as a backdrop for key scenes, the first being 1995’s teen comedy Clueless – starring Alicia Silverstone as popular high-schooler Cher. In the movie she can be seen shopping at the ‘Two Rodeo’ mall and also in several other places on Rodeo Drive, including Tiffany & Co. Rodeo Drive was also home to Julia Roberts’ shopping spree in 1990 romantic comedy Pretty Woman and if you’re looking for the iconic hotel where Roberts stays in the movie, it’s the Beverly Wilshire – also in Beverly Hills. Greystone Park & Mansion is a gothic estate built in the 1800s and has provided the backdrop for dozens of movies including X-Men, There Will Be Blood, The Social Network, What Women Want, Ghostbusters II and The Bodyguard. The mansion itself is only open to the public on special events, but the grounds are open most days. Any self-confessed movie buff will recognise the Nakatomi Plaza from 1988’s Die Hard, the scene of Bruce Willis’ fightback against a group of 'bad guys' led by Alan Rickman. The building is real and is actually The Fox Plaza, which is home to movie studio 20th Century Fox. 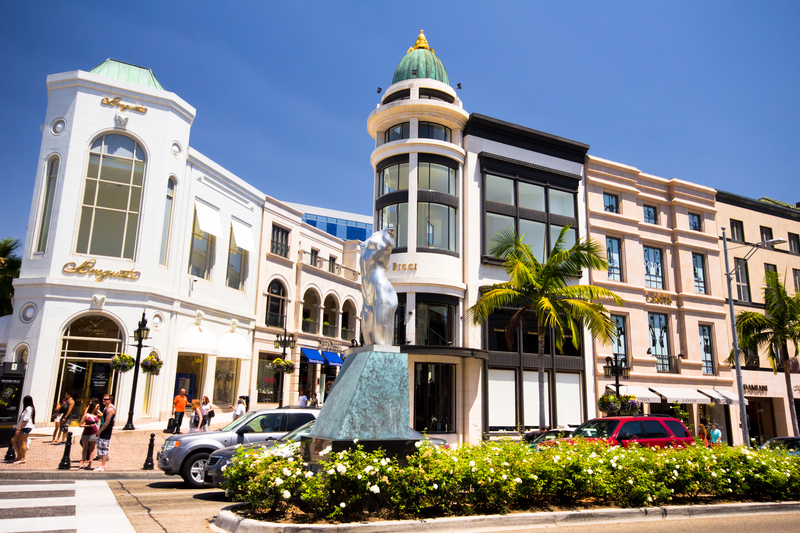 It’s in Century City, just on the border of Beverly Hills and can be seen from the surrounding streets. Downtown Los Angeles, with its distinct character and urban grit has provided filming locations for several darker movies. In the drama Nightcrawler, Jake Gyllenhaal’s seedy paparazzi character Lou lives on Figueroa Terrace in Chinatown, an unassuming street that does offer fantastic views of the Los Angeles skyline. Comic book movie Suicide Squad also used downtown locations for its dark adaption of the DC franchise. If you’re fortunate enough to stay at or visit the Millennium Biltmore Hotel, right in the heart of the financial district, you may recognise several famous parts of the building. Chinatown (1974) used a side-entrance to the hotel as a double for the famous Brown Derby restaurant, whereas the main entrance featured in the 1984 comedy Splash starring mermaid-human couple Darryl Hannah and Tom Hanks. The most famous part of the building is the Crystal Ballroom, which popped up in The Fabulous Baker Boys, True Lies and the high-school prom in Pretty in Pink. Santa Monica, and the Santa Monica Pier in particular, are some of the most attractive parts of the city, heavy with tourists and eye-catching backdrops. 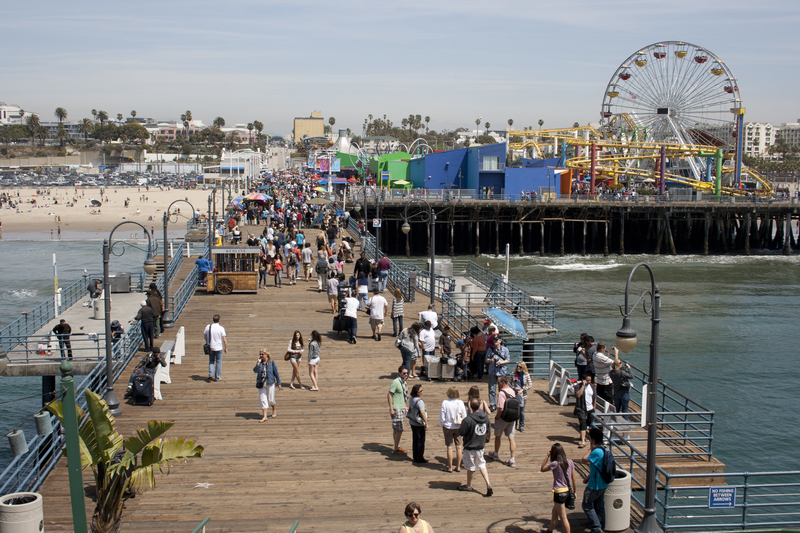 The Santa Monica Pier has featured in a host of movies including the Chevy Chase comedy Fletch, Forrest Gump, Iron Man and recent sci-fi romance movie Her, starring Joaquin Phoenix and Scarlett Johansson. Beachside carousel “The Santa Monica Looff Hippodrome” featured in crime caper The Sting with Robert Redford and Paul Newman, which was actually set in Chicago. Santa Monica Beach has frequently popped up in movies over the years, including Lethal Weapon, the biopic Ray and an unforgettable musical performance by Miley Cyrus in Hannah Montana: The Movie. You’ll also recognise it from the slow-motion training montage from Rocky III, where Apollo Creed and Rocky Balboa indulged in some amazing eighties bromance in the Pacific Ocean. Away from the beach, fans of Richard Kelly’s 2001 dark fantasy drama Donnie Darko might want to pay a visit to the Aero Theatre on Montana Avenue in Santa Monica, the location where Donnie has a spooky cinema encounter with Frank the Rabbit. When you get out of the centre of Los Angeles to the south east of the City, you’re on the way to Anaheim, Orange County and the most magical place on Earth – Disneyland. Before that you’ll pass through the suburban areas of Downey and Whittier, both used extensively in movies new and old. Whittier High School provided exterior locations for Back to the Future I and II and the nearby Puente Hills Mall played the Twin Pines/Lone Pine Mall where Marty and The Doc first travel back in time. Suburban paranoia movie Disturbia, starring Shia LaBeouf, was filmed in the leafy streets of Painter Avenue in Whittier, just a few miles away from Youngwood Drive, where you can see the family home of the Wormwoods in the big screen adaptation of Roald Dahl’s Matilda. Sci-Fi fans might recognise the Skyrose Chapel in Whittier better as the Vulcan Science Academy where Spock appeared before the Vulcan Council. Closer to the city, you’ll find the Oscar de la Hoya Boxing Youth Center on South Lorena Street which was featured in the original Rocky movie in 1976.